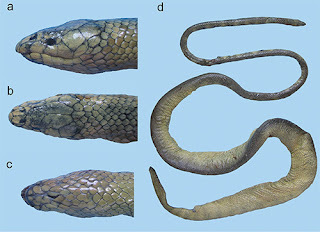 Fossils suggest there have been snakes in the oceans since the Cretaceous, the limbed snakes like Pachyrhachis were marine, and fossil evidence from the Eocene suggests some spectacular marine snakes, such as Palaeophis grandis and Pterosphenus schucherti were present during the maximal thermal conditions of the time. But, despite evidence for early invasions of the oceans, snakes have apparently had difficulty adapting to marine environments. A=Aquatic species present in clade, M= marine species present in clade. species = approximate number of species in clade, Age is in millions of years ago. Clades highlighted contain aquatic species.